Event Description What is the "Greasy Dozen Run"
In honor of the builders efforts, sponsors and the followers of The Greasy Dozen we host this free event. 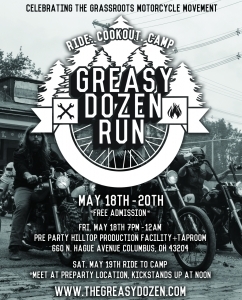 The Greasy Dozen Run is an organized ride through some of Ohio's best winding back roads. The run starts in Columbus, Ohio and lead's to the campsite where the festivities will be held, builders bikes will be on display, bike games, camping, food, and much more! More Details to come (if you can't make the run, you can ride straight to the camp site at your convenience). The GDR remains a traditional grassroots motorcycle event that is built around bringing like minded individual's together! We want to give back to the people who help keep these small shops and business afloat in a world run by large corporations. The Greasy Dozen Run is a free event and will remain a free event as long as we're around! You're probably wondering what is included in this free event... so here are the details! *Product toss from our long list of rad sponsors! Check out the Greasy Dozen website and follow us on Facebook and Instagram for updates! *SPECIAL GREASY DOZEN ANNOUNCEMENT* Himalayan Heroes is giving away a trip at The Greasy Dozen Run! One lucky person will be winning a trip to India to rip through the Himalayan mountain range! Be sure to get your ticket ASAP, only 1000 tickets available for this giveaway! Click here to get your ticket now!